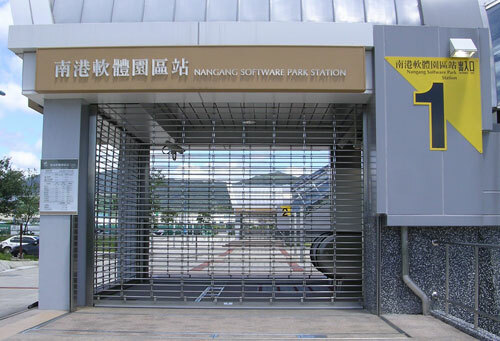 Also, “Nangang Software Park” (Nángǎng Ruǎntǐ Yuánqū 南港軟體園區)? There is no other software park around the MRT system. Just “Software Park” would work better as a name for the station. Accurate, but also short, simple, and distinctive — just what such a name should be. 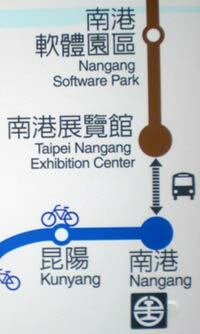 BTW, this software park is the source of the name for Taipei’s still-not-corrected Park Street signs. Worse still is “Taipei Nangang Exhibition Center”. First, calling it even “Nangang Exhibition Center” would be bad enough for the same reason that “Nangang Software Park” is unnecessarily wordy: there’s no “exhibition center” anywhere else on the system. Here’s a photo of the exhibition building itself (not the MRT station — though those are the MRT tracks behind the barrier in the foreground). 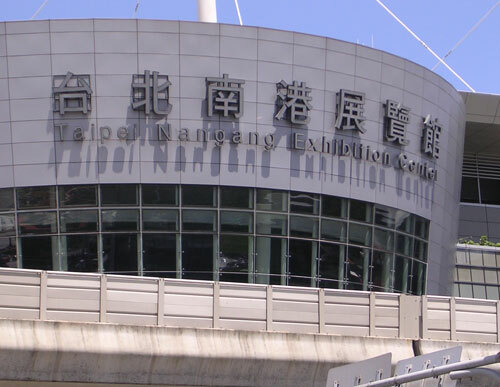 So “Taipei Nangang Exhibition Center” probably is the official name of the complex. But that really doesn’t matter because (1) the MRT station certainly does not have to have the exact same name and (2) the name is just plain stupid. Above, I mentioned that names for MRT stations should be “accurate, but also short, simple, and distinctive.” Sticking “Taipei Nangang” in front of “Exhibition Center” makes the name clumsy and less distinctive, especially since the two MRT stations closest to “Taipei Nangang Exhibition Center” are called “Nangang” and “Nangang Software Park”. Nangang, Nangang, Nangang — yeah, we get it: They’re in Nangang. But perhaps those names aren’t nearly informative enough. According to the MRT’s way of thinking, people might still be confused about the location. How about, say, “Planet Earth Northern Hemisphere Asia East Asia Taiwan Taipei Zhongzheng Chiang Kai-shek Memorial Hall” and “Planet Earth Northern Hemisphere Asia East Asia Taiwan Taipei County Xindian Xindian City Hall,” etc.? Then administrations could have fun changing from one system to another, depending on who was in power. There’s more to say about this topic (e.g., how the names of stations such as Taipei Zoo, Taipei City Hall, and Xindian City Hall Office do or don’t fit into this pattern). But I’ve already written enough for one post. And in case anyone is wondering: Yes, I have brought my concerns to the attention of the officials of the MRT. They don’t care. Does anyone have contacts in the media or with politicians? This entry was posted in Chinese, English, languages, Mandarin, pinyin, signage, Taipei, Taipei MRT, Taiwan by Pinyin Info. Bookmark the permalink. The one near my house is pretty good. ??? (Dazhi Station). I don’t believe there are any other Dazhis on the Taipei MRT system. But perhaps they will build another Dazhi one day. What will we do then? “Taipei Nangang” doesn’t strike me as being lousy. Maybe that’s because I’m far more sensitive to the opposite problem you usually see in Chinese-to-English translation: translators who have been fed that stupid line about “Chinese go from most general to most specific; Westerners go from most specific to most general”, and thus take whatever sounds natural in Chinese and formulaically write it exactly backwards in English. E.g. “Zhongguo Shandongsheng” becoming “Province of Shandong of China” rather than the more natural-sounding “China’s Shandong Province”. There’s a bus stop on Heping btw Fuxing and Jianguo, named something like “National Taipei Education University Associated Vocational High School”. The English recording has to say it at something like double speed to get it all in. there will only ever be one technology building. @Eric: It would be more likely to translate it as Shandong, China – returning to the specific->general formulation. There weren’t any possessives in the Chinese version so ‘China’s Shandong Province’ and ‘Province of Shandong of China’ are not accurate renditions – unless the ‘de’ is understood? I’ve always wondered why the powers-that-be decided the station names had to be translated into English in the first place. Subway station names in Japan are almost always rendered in roman letters exactly the way they are read in Japanese – i.e. ?????? is “Kokkai-gijid?-mae”, and not “National Diet Building” (let alone the most literal translation, “In front of the National Diet Building”!). As a Parisian, I can only look with envy on that number of incidents graph. Sure, Paris has good subway station names and an NMCNSNSSC of zero, but we can only dream of having as clean and reliable a subway as Taipei’s. I hope no one tells the Taipei MRT people about this: Next London Subway Stop: Spiritual Enlightenment. I have to disagree. Just because there is only one software park or exhibition center in the system now doesn’t mean there won’t be in the future. Following your suggestion, there would then be “Exhibition Center” and “Blah Exhibition Center” stations, and people would abbreviate the latter as just “Exhibition Center” (especially when they’re closer to it than the other), leading to much confusion. That’s sort of the situation in Shanghai, with “Shanghai Railway Station” and “Shanghai South Railway Station” in opposite directions on the same line. The non-South station is more prominently signed because it used to be the end of the line, and I’m sure some people have ended up there when they meant to go to the other. It appears someone told TVBS, a popular TV news station, about this, as this post was cited in a story that just aired. (I didn’t see it myself.) Given how stories are rerun, it might air again sometime between 8:35 and 8:45 this evening. Sorry, my clock stopped. Make that earlier. Here’s a link to a write-up: Nèihú jiéyùn y?u “f?nyì” jiàn — zhàn míng Y?ngyì w?ngy?u b?zhàn (????????????????). It’s not a very good article, though, and it features one of my least favorite approaches: ask a random foreigner what they think. That’s the sort of thing that stuck us with nicknumbering. But, still, I suppose it’s better than nothing. Anyway, if someone in the media wants to talk with me, I’m not hard to find. This penchant for long names in Taiwan seems also extends into government branches, and the insistence of local writers to include the entire hierarchy of branches and sub-branches in the name of the office. * Office of Animal Cruelty Prevention, Bureau of Animal Affairs, Council of Agriculture, Executive Yuan, R.O.C.